Attendees at the annual meeting of the Society of Vertebrate Palaeontology (SVP) in Calgary (Alberta, Canada), were treated to a presentation outlining the discovery of a trio of young oviraptorid dinosaurs that may have been preserved sleeping as a group. This might provide the first evidence of communal roosting, a practice seen in many extant animals today, where members of the same species sleep together for mutual protection and to help keep themselves warm. Communal roosting is seen in many species of birds, notable examples being starlings and rooks. Communal roosting is also known amongst primates, bats and butterflies. Although, it is easy to misinterpret fossils of this nature, oviraptorids, members of the Maniraptora clade of dinosaurs which are closely related to Aves (birds), are believed to have been social animals and a spokesperson for Everything Dinosaur stated that behaviour of this nature is within the “realms of expectation for these dinosaurs”. 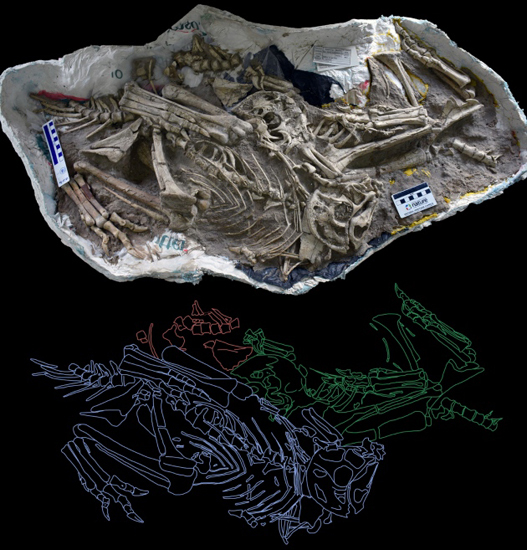 The Fossilised Remains of Three Oviraptorid Dinosaurs – Is this Evidence of Communal Roosting? The three oviraptorid fossil skeletons within the single block. The picture above shows the plaster-jacketed block containing the three individuals and a line drawing showing the location of each skeleton and the layout of the bones. Greg Funston (University of Alberta), who led the fossil study explained that the three sleeping dinosaurs were probably relatives, perhaps from the same brood. The fossil material first came to the attention of academics when Mongolian customs officials seized the specimen at an airport in 2006. The stone block was being illegally smuggled out of the country, sadly, there is a thriving black market in illicit fossils from Mongolia and China, despite the very best attempts of the authorities to stop this trade. Identifying the source of such illegally acquired fossils is always tricky, but a geochemical analysis of the surrounding matrix by scientists from the University of Bologna (Italy), led by Federico Fanti, suggested that the fossil came from the Bugiin Tsav area of the Gobi Desert (Upper Cretaceous sediments associated with the Nemegt Formation – Maastrichtian faunal stage). Dr Fanti has also presented his findings at the SVP. Oviraptorids were extremely bird-like, feathered dinosaurs, with short skulls, beaks and deep lower jaws which were largely edentulous (lacking teeth). Several genera have been named and these dinosaurs lived in the northern hemisphere during the Late Cretaceous. Most of these dinosaurs were relatively small, around two-three metres in length (Gigantoraptor being an exception) and they were particularly abundant in Asia. Fossils of their nests have been found, along with adults incubating eggs. Most palaeontologists believe that these dinosaurs were social animals with similar behaviours to those seen in extant birds. The diet of oviraptorids is uncertain, these bipeds could have been mainly herbivorous, but omnivory and durophagy (eating hard-shelled items like nuts, seeds and molluscs) is not ruled out. An Oviraptor dinosaur sitting on her nest. Two of the dinosaurs have been preserved crouched down on their stomachs, these two specimens, which are more complete than the third, have their necks curled back towards their bodies, whilst their arms cradle their heads, this is very reminiscent of a sleeping posture adopted by many types of living bird. The fossilised remains of allegedly sleeping dinosaurs have been found before, perhaps most notably Mei long from the Liaoning Formation of north-eastern China. M. long was named in 2004 after a spectacular fossil showing a head tucked under an arm and a tail curled round the body was discovered. This little troodontid was either resting or sleeping when it was smothered by a layer of volcanic ash. Mei long – sleeping dragon. This is the first fossil evidence to support the idea that some kinds of dinosaurs roosted together (communal roosting). Bone histology indicates that these animals were juveniles and roughly the same age when they died, it has been speculated that this fossil represents a “teenage gang” of sub-adult dinosaurs that died in their sleep. If the layout of the fossils reflects their true posture and the bone position has not been affected by the fossilisation process, then the position of the three dinosaurs implies they were touching each other. The researchers think the youngsters were probably huddling for warmth. That suggests that the animals had tried to maintain a constant body temperature, or perhaps they were frightened and huddling together for protection and comfort. David Varricchio (Associate Professor at Montana State University), has commented that he wondered whether these dinosaurs were resting or taking shelter from harsh weather rather than sleeping. Funston argues that modern animals that roost together don’t usually make direct contact except for warmth. Animals that died in events such as floods are preserved in very different positions from that of the oviraptorid trio, making it unlikely that the young dinosaurs were awake when they met their demise. However, this fossil material is interpreted, it adds to the growing body of evidence that many types of dinosaurs, including Maniraptorans were highly social creatures and capable of exhibiting quite complex behaviours.